When she asked the question, the dam broke. I'm surprised she could even understand my answer through the sniveling. With my newborn second son cradled in my arm and the phone balanced between my chin and shoulder I threw caution to the wind and told her all my fears. We didn't know each other that well yet, but she was an experienced mom of 4 kids and had called at just the right time to ask me how life was at home with my new little one. She reached through the phone with her voice and sternly told me that I would be fine, my boys would be fine, LIFE would be fine. She beat back the wild fears that had overtaken me and calmed my heart with these words, "The best gift you can give your child is a sibling. Stop worrying about all material things you might not be able to give and think about all you've already given him by giving him a brother." Fast forward 20 years and it's pretty obvious that we've taken that advice and run with it! My brood has grown from those two to eight. My friend Diane has also put her money where her mouth is and she too is the mother of eight. We both have six the old fashioned way and two by adoption. Her adoption story is the culmination of the bedrock belief she shared with me so many years ago. God uses the greenhouse of a family to form character and personalities and produce strong, healthy adults out of the little bundles that start out in their Mommas' arms. There is something profoundly powerful that happens within the four walls of a home. So when she and her husband were faced with a plea to adopt two little boys who had no family, their answer quickly became, "How can we not?" Never mind that most of their children were grown and having children of their own and this would mean going all the way back to the toddler years. Never mind that living in Thailand as missionaries makes the adoption process wildly complicated, confusing and expensive. Never mind that it's hard. The stakes were high. 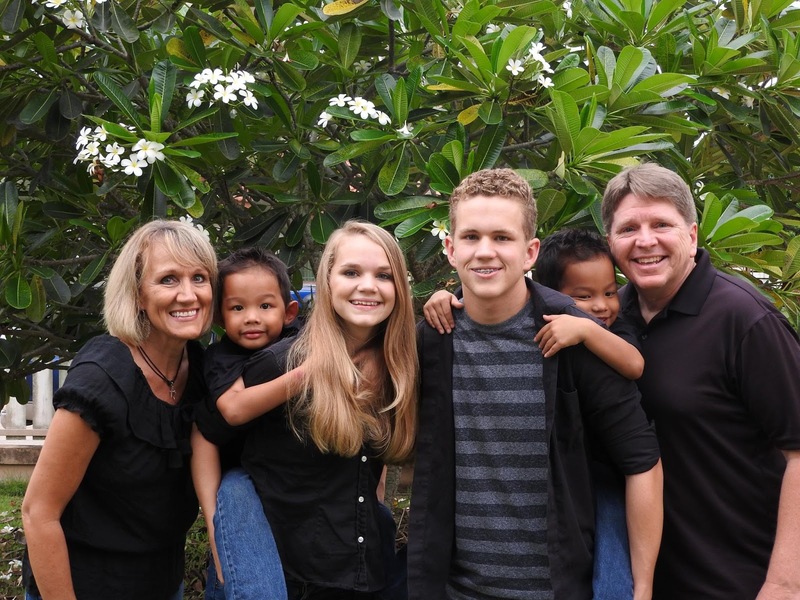 The boys needed a family and Dave and Diane were willing to share theirs. 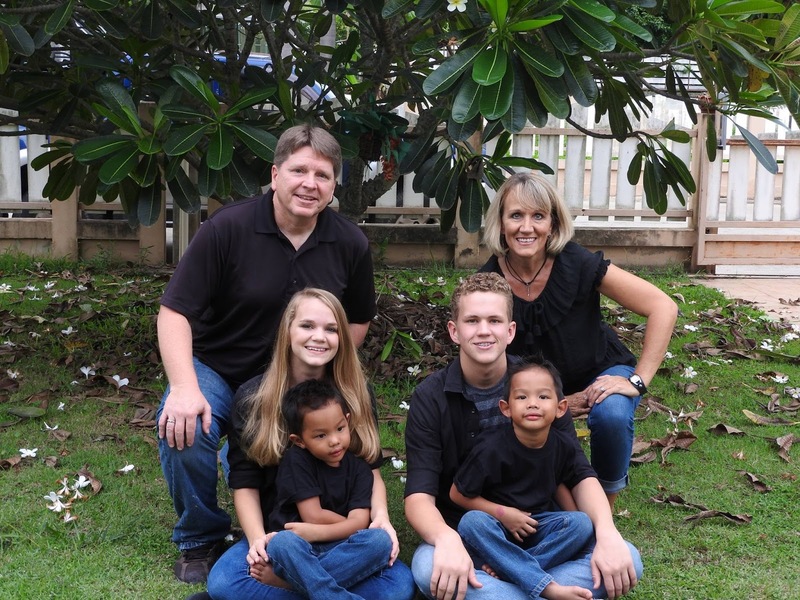 Diane & Dave with their youngest two biological kids and two adopted boys. Attachment is a big buzzword in adoption circles. 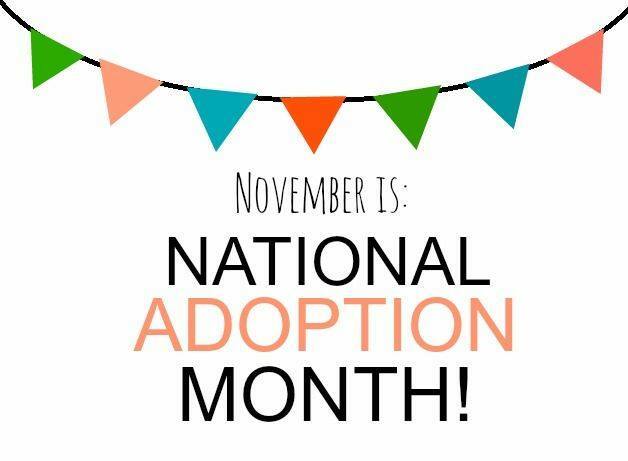 Creating connection and helping orphaned children be able to form a healthy attachment to a parent is the primary goal in adoption. Attachment has gained it's priority status for good reason - it's the magical power of family. Attachment equals trust. Trust equals courage. Courage equals obedience. Obedience equals progress and growth. Attachment happens so naturally and beautifully when a baby is born into a healthy, intact family. The daily activities of feeding and care wrap tiny yet strong webs of connection around the baby and it's parents. Without a conscious thought of why the baby turns into a toddler who believes the things his parents are teaching him are true. The toddler turns into a child who will calm down and believe his mom who tells him that he will survive the bee sting and she knows what to do. The child turns into a teenager who will dare into the unknown finding confidence in the encouragement of his parents. Adoptive parents are on a quest to reclaim this power for their children. It's hard, hard work but it's possible. It's redemption and restoration; beauty from ashes. Before adoption counselors and attachment seminars, there was an adoptive dad who seemed to get it right all on his own. Mordecai gave his adopted daughter, Esther, the magic of family and she gave the world the gift of her courage and obedience. Esther was actually Mordecai's cousin, the daughter of an uncle whom he raised as his own after her parents died. They were all alone in a foreign land where they had been carried away into exile. None of their circumstances made a healthy home easy. 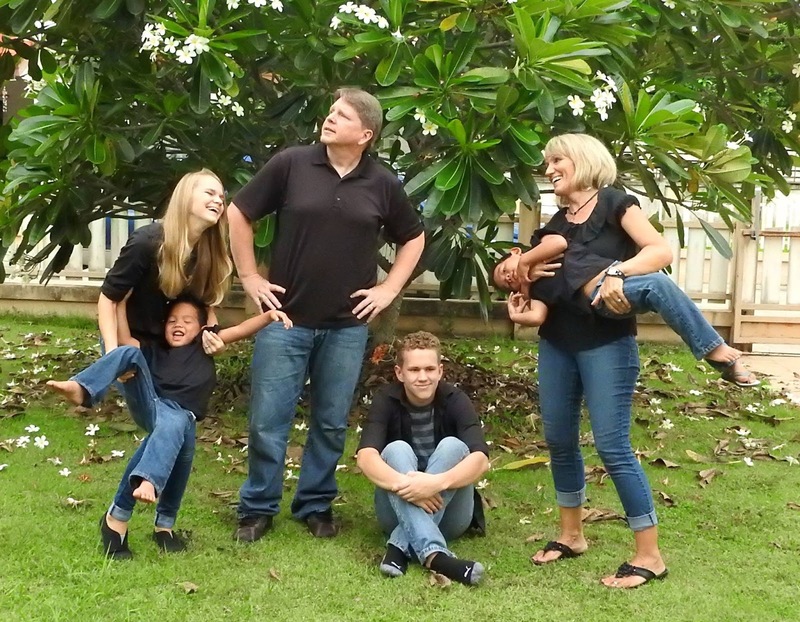 They had every reason to be a wildly dysfunctional family. Esther endured deep trauma: the death of her parents, forced relocation to an unfamiliar hostile culture, a single adoptive father and then a forced marriage. How am I so sure they weren't the mess you would expect them to be? Because of what Esther did. The king of their captor's country was looking for a new queen and used a beauty contest as his tool to find one. Esther's beauty made her quickly rise to the top of candidates and her humble spirit caught the attention of the king. She was chosen to be queen which at first blush seems likes she won the lottery until you put yourself in her shoes and realize that she was really a victim of human trafficking. She had the strength to endure gracefully. When the crisis came, she was alert and strong. Through a series of events recorded in the book of Esther, the Jewish people found themselves on the wrong side of an evil, yet powerful man in the king's court. His nefarious trickery ended with an official royal decree ordering the extermination of the Jewish race in Babylon. Mordecai caught wind of the evil man's plans and brought it to the attention of his adoptive daughter, a Jew and the queen of Babylon. Esther didn't immediately jump into action. She knew the stakes were high here and that a misstep could cost her everything. Mordecai had encouraged her to make a plea on behalf of her people before the king but her first action was to confirm his instructions. She knew that even the queen would put her life on the line to presume that the king would want to see her unrequested. Her heart must have been in her throat as she waited for Mordecai's response. Is this really what he was asking of her, to risk her life? Mordecai's response in chapter four, verse twelve is very clear. He knew he was asking for the hardest obedience yet his words were strong. He called her to be brave and to trust him with her life, death, and legacy. Esther's answer was immediate and total. She had formed a habit, one step at a time, of trusting Mordecai's love by obeying his instructions as he was bringing her up. Those steps led her to this final, important act of obedience. One that carried with it risk and uncertainty like she had never faced before. The circumstances of Esther's life didn't add up to a woman who should have the poise and confidence to do something like this...except for the miraculous power of family. Her attachment to Mordecai led to trust. Because she trusted him, she was able to be courageous in the face of danger. Her courage gave her the power to obey. Her obedience was evidence that she had become a woman of principles and depth who's mission was bigger than her own life. God brought beauty from ashes and used the orphan girl to become a hero to her people because Mordecai had been willing to be a hero to her. God offers this to us too: attachment, trust, courage, the ability to obey, and a purpose beyond our own lives. We are His adopted sons and daughters who come from trauma and circumstances in our lives that should keep us bound in fear and selfish motives...except for the miraculous power of family, the family of God. He shows us the power of attachment in our own lives and we grow in our trust in Him. We trust Him a little and test the waters with obedience that is little and safe. We grow up a little as we find out that He is trustworthy and gain enough courage to take the next step. And before you know it, He has built a heart that is ready to say "yes" to obedience that is risky and makes the heart pound. Obedience like adopting two little Thai boys who need a family. Mayra and I shopping in a Thai market with Diane. 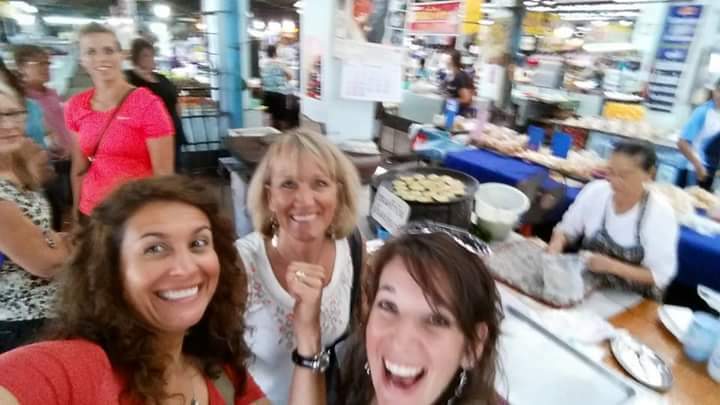 My girlfriends and I go on many adventures together but can't seem to remember to get a decent photo of them! My friend Diane, is living her advice to me. She is choosing to beat back her own wild fears because she trusts her father and He is telling her to go. Her sons, like Esther and all the rest of us adopted sons and daughters of God, will grow up with the restored ability to walk into dangerous obedience because they've learned how to trust. Adoption is a beautiful thing. It's all about wresting redemption out of brokenness and beauty from ashes while being a mirror for our own souls.